This industrial fine dust vacuum cleaner is the solution the market has been waiting for. It handles fine dust with ease, has an anti-clogging filter system, easy waste disposal and an operator friendly nature. 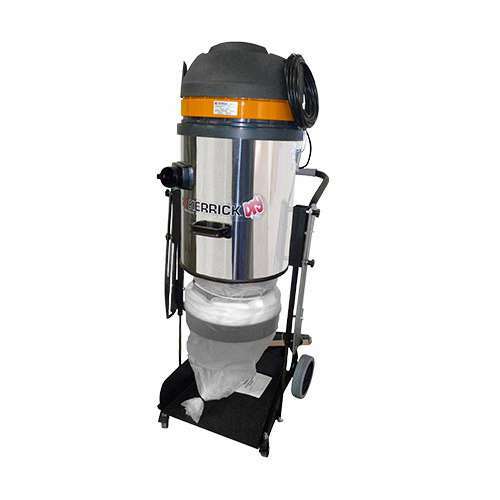 The 3 Flow Maxi Bag Fine Dust Vac features automatic and continual filter cleaning during operation. Working automatically and cyclically 2 motors provide suction while the other motor idles and is cleaned. This innovative cyclone system prevents down time and expenses from clogged filters and burnt out motors! Instead of a standard tank the machine comes equipped with a 20m long maxibag system that can be sectioned off and thrown away as required, without disrupting operations and without releasing waste materials into the air.